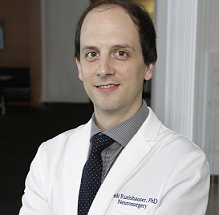 Ueli Rutishauser, PhD, is an Associate Professor and Board of Governors Chair in Neurosciences in the Department of Neurosurgery, with joint appointments in the Departments of Neurology, Biomedical Sciences, and the Center for Neural Science and Medicine at Cedars-Sinai Medical Center. Concurrently, he holds a joint visiting faculty appointment at the Division of Biology and Biological Engineering at the California Institute of Technology. Dr. Rutishauser studied computer science for his BS, and then received his PhD in Computation & Neural Systems from Caltech. After postdoctoral studies at the Max Planck Institute for Brain Research in Frankfurt, Germany, he started his own lab in 2012. He received the Amercian Epilepsy Society Young Investigator Award (2007), the Ferguson Award (2008), the Troland Award by the National Academy of Sciences (2014), the Prize for Research in Scientific Medicine (2017), and the Freedman Prize for Exceptional Basic Research (2018). In 2014, he was named a Next Generation Leader by the Allen Institute for Brain Science and in 2018 he became an elected member of the Memory Disorders Research Society. He co-edited the textbook "Single neuron studies of the human brain" by MIT press and is one of the principal organizers of the Human Single Neuron meeting. His work has been published in a variety of journals, including Nature, Nature Neuroscience, Neuron, PNAS, Current Biology, PLOS Computational Biology, and Neural Computation. The Rutishauser laboratory is investigating the neural mechanisms of learning, memory and decision-making at the level of single neurons in humans. We are a systems neuroscience laboratory and use a combination of in vivo single-unit electrophysiology in humans, intracranial electrocorticography, eye tracking, behavior, and computational and theoretical approaches. We have helped pioneer the technique of human single-neuron recordings and continue to advance the tools, methods and surgical techniques that allow such experiments. Recent work has focused on the neural representation of novelty and familiarity in the human hippocampus, amygdala and basal ganglia; the theta rhythm; investigation of learning abnormalities in movement disorders; and the neural representation of faces and emotions in the amygdala. Refer to my Laboratory Homepage for research interests, lab members, and news about the lab.